How do my colleagues and the members of their practice access interactive patient charts online? Depending on the information the provider has in their contact details, they will receive their invitation to access the interactive chart via fax, email, or if they have both on file, they'll receive both. When you sign and send your letter or referral, a fax is sent to your recipient*. Both on the cover page and the letter or referral page, there are instructions explaining how to access your interactive patient chart online. *If you opted to fax copies of your letter or referral attachments, they will also be included with the fax. The fax Reference Code is listed on the fax in the areas circled above. (**If you received an email version, you will need to call the sending practice for their "Provider Security Code" located in the top right corner of their Practice Home Page). Anyone in the recipient's practice can set up an account to view interactive charts in Elation sent to their practice. The process is extremely quick: select whether you're a provider or staff member, enter your name, then set a password and security question. As an added convenience, Elation will help make sure your password meets our requirements as you type it. Your recipient lands in their very own Practice Home, displaying the patient chart and letter or referral that was shared. From here, your recipient can click "Reply" to reply to the letter directly from Practice Home, or can click "View All" to be taken into the patient's chart, which is pre-populated with the content that was included with the letter or referral. Use the full power of the Elation chart to consume patient information: search, trend data, view reports, even write their own notes. Access all interactive charts that are shared with their practice in the future. Step 1: The provider receives an email from Elation notifying them a that information has been shared with them. Step 2. Provider opens the email and clicks the blue "View Shared Clinical Information" button. Step 3. Provider is redirected to the signup page. Step 4. Provider selects a Password and enters the 6 digit Security Code. If they don't know the security code, we show the sharing provider's office phone number on that page so they can call and receive the code from the Elation practice. 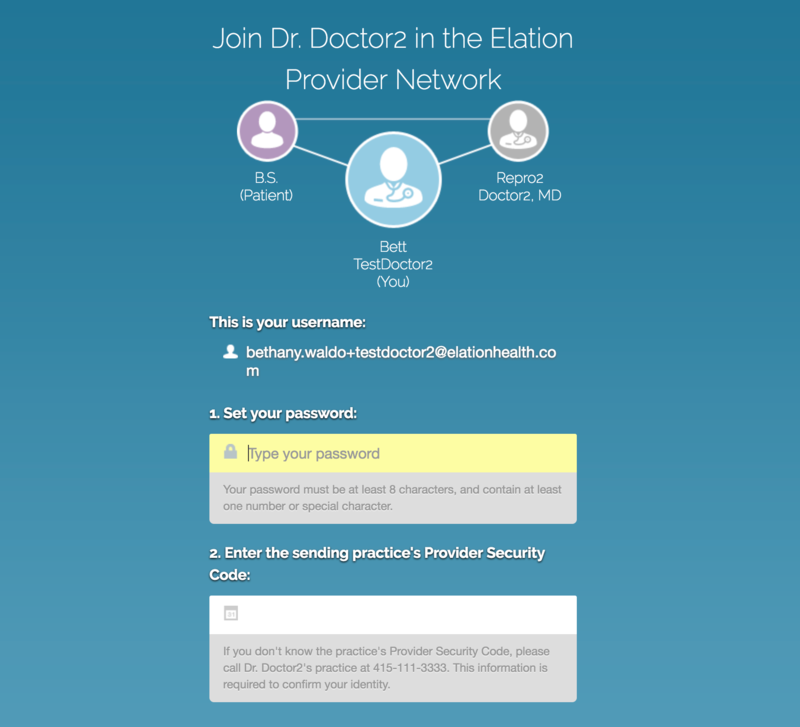 The Provider Security Code is located in the upper right side of the page within Elation, as seen in this screenshot. Step 5. Once the two steps above are complete, click "I agree, Create My Account"
Anyone in the practice who has not already signed up can click "My name is not listed here" to quickly set up an account to view interactive charts in Elation. In the event of a forgotten password, your recipient will be prompted to answer the security question that he or she set up when the account was created. After answering correctly, your recipient can reset their password.